So that didn’t work out. The next morning, which was the birthdays, I ran to the grocery store. Now, I know that the chocolate cake/white frosting combo is just particular enough that most stores don’t carry more than one (if even that) ready to purchase. Happy Birthday to my boys…but mostly, Happy Easter. 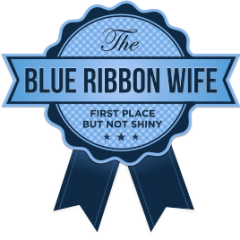 B, that is a Blue Ribbon Wife. Posted on April 8, 2013 by BRW. Bookmark the permalink. ← The gift that keeps on giving.